Originally from Edinburgh, he studied sculpture at GSA , 1983-7, and works from a studio in the Glasgow Sculpture Studios, Maryhill. The winner of the Benno and Millie Schotz Award in 1991, he has exhibited widely in the UK, France and Scandinavia, including the major shows Hyperboreans, Glasgow (1992) and Work 1995-98, Bristol (1998), and has won several prestigious commissions for public sculpture in Scotland. His work in Glasgow includes the Cherub and Skull, Tron Theatre (1999), The Calf, Graham Square (1999), The Castlemilk Dome, Castlemilk (1999) and Citizen Firefighter, Gordon Street (2001). 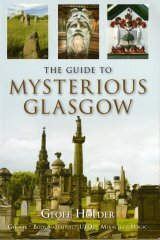 Outwith Glasgow, he has executed public work at Hamilton, Four Youths (1998), and Sunderland, Interalia Stevenson Trail (1995). One of his most recent commissions, Man Walks Amongst Us (2000), a statue of Christ, was awarded by Glasgow City Council to mark the Christian Millennium. His work is represented in the Scottish Arts Council, the British School in Athens, SNPG , and GOMA . Glasgow City Council. Use the search facility to go to: 01/11/2000 �man walks among us� - jesus 2000 commission unveiled.